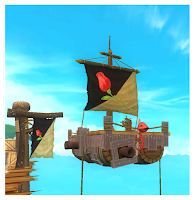 I'm back today to talk about the first item on my "10 Ways to Make Pirate101 More Challenging" post. For this challenge, the goal is to make it through the entire game without upgrading your ship or ship equipment, at all. That means you will be using your Skull Island raft (similar to my swashbuckler's to the right) for the whole game. Are you thinking this would be impossible? Well, just to double check, I did some experimenting in Aquila to make sure those high level ships wouldn't totally destroy your raft in one hit. Guess what! They won't! Okay, maybe they could with two hits, but that definitely gives you time to get pulled into broadside combat. 1. Once you receive your raft, no upgrading it with ship equipment. 2. 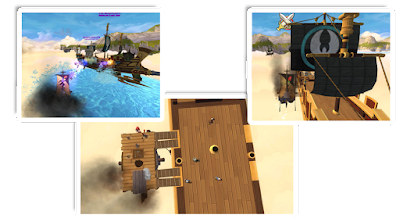 You must use your raft for every ship battle in the main quest line, with one exception (see below). 1. Timing is everything, especially in the higher level worlds. Don't stop and try to fight, just steer your raft straight into the enemy ship. 2. Since you won't be spending much gold on ship stuff, use your extra money for better gear and upgrading companions. This should help all your battles go smoother. The Scylla fight in Aquila is the only battle that you will not be able to complete with your raft. You can use any ship and equipment you'd like to use for this quest. If you would like more of a challenge, maybe try using a Mooshu ship. I'm not sure if that's even possible, but it would be a fun challenge. I have heard that Scylla can be defeated with the Marleybone ship, so you could always try that. However, I would suggest getting an Aquila ship and equipment, if you can afford it, since who knows what the next world will bring. 1. If you back out of range, any head that has taken on damage will heal itself. However, once a head has been completely defeated, you can back out to give yourself time to heal without it regenerating. 2. Focus on killing one head at a time. 3. Remember that if your ship is taking too much damage, your blue potions will restore all of your hit points. Potions can be used during any ship battle. 1. Complete this same challenge, except with the second ship you receive in Skull Island. 2. 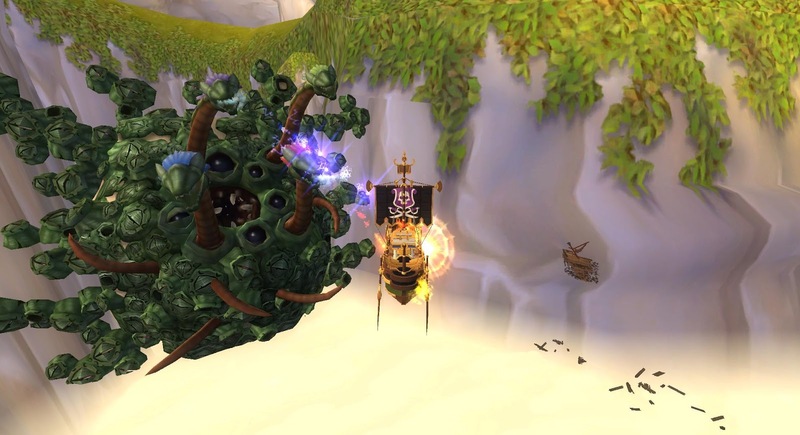 Upgrade your ship throughout the game, but always use a ship that is 2 worlds below where you're currently questing. 3. Come up with your own rules! Remember, the point of these challenges is to add to your experience with Pirate101, not to make it totally frustrating. Use these challenge guides as a jumping off point and tweak them to fit your questing style.